Color :Silver-Lined Frosted Ruby, Size: # 1- (3mm), Qua ntity: 15 grams bag of loose beads. 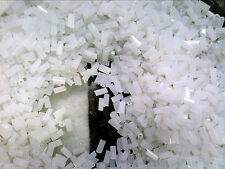 These beads are manufactured by TOHO of Japan and are known as one of the best and most uniform glass beads. FROSTED WHITE SHORT SATIN atlas BUGLE BEADS. 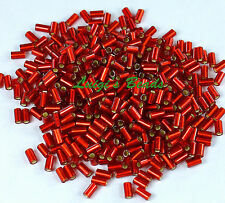 SPACER BEADS. this LOT IS 50. 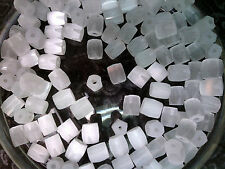 White FROST HEX CUT BUGLE BEADS. this is for.200 grams. 1 LONG HANK. I collected these, as did my aunt and uncle. All are perfect for your beading creations such as beaded earrings, pins, necklaces, one-of-a-kind jewelry, loom beading, RESTORATION, weaving, embroidery, collage, and your unlimited creativity! High quality glass bead. 12mm size 5 matte iridescent ruby bugle. High quality glass bead. 4mm size 2 matte iridescent crystal bugle. High quality glass bead. 4mm size 2 matte transparent cobalt bugle. High quality glass bead. 12mm size 5 matte silver lined gold bugle. High quality glass bead. 4mm size 2 matte transparent teal bugle. High quality glass bead. 12mm size 5 matte iridescent topaz bugle. High quality glass bead. 12mm size 5 matte iridescent crystal bugle. High quality glass bead. 4mm size 2 silver lined matte crystal bugle. High quality glass bead. 12mm size 5 matte iridescent dark topaz bugle. High quality glass bead. 12mm size 5 matte ruby bugle. High quality glass bead. 12mm size 5 matte cobalt bugle. High quality glass bead. 12mm size 5 matte teal bugle. High quality glass bead. 12mm size 5 matte crystal bugle. High quality glass bead. 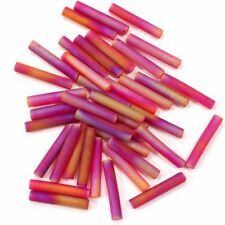 4mm size 2 matte transparent light rose bugle. High quality glass bead. 4mm size 2 matte transparent crystal bugle. High quality glass bead. 12mm size 5 matte dark topaz bugle. High quality glass bead. 4mm size 2 matte iridescent sapphire bugle. High quality glass bead. 4mm size 2 matte iridescent dark aqua bugle. High quality glass bead. 4mm size 2 matte iridescent dark topaz bugle. High quality glass bead. 4mm size 2 matte iridescent light topaz bugle. High quality glass bead. 4mm size 2 matte iridescent teal bugle. High quality glass bead. 4mm size 2 matte iridescent black bugle. High quality glass bead. 4mm size 2 matte transparent dark topaz bugle. High quality glass bead. 4mm size 2 matte transparent ruby bugle. High quality glass bead. 4mm size 2 matte transparent dark aqua bugle. High quality glass bead. 4mm size 2 matte transparent green bugle.